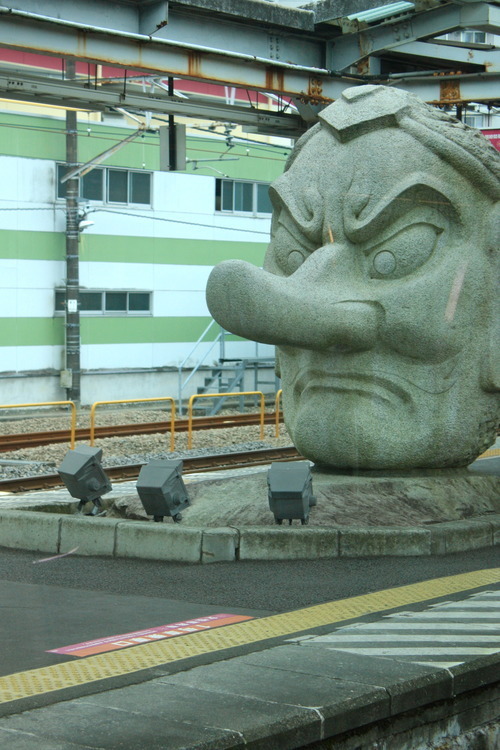 Awaking to the chipper, automated voice of a Japanese woman as she announced my train’s arrival at Takao Station, I sleepily looked out the nearest window to find a large stone tengu head, staring defiantly down the platform to my left. 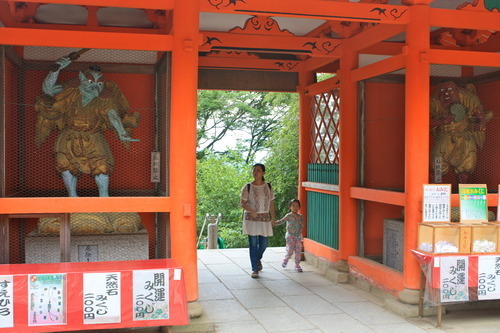 Primarily known for Yakuo-in, a Buddhist temple dedicated to tengu and other spirits from Japanese folklore, Mount Takao is Japan’s smallest recognized mountain, but nonetheless a very important one. Since I hadn’t eaten before I embarked on the hour-and-a-half long train ride from Tokyo Station, I decided to remain at the mountain’s base and try some of the local flavor before starting the climb. 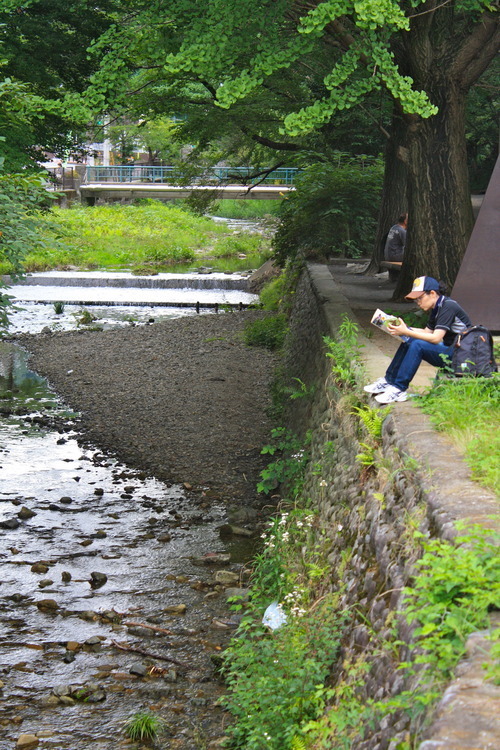 Following the town’s humble river, I didn’t have to walk far before I found a surprisingly cheap noodle restaurant, which advertised its fresh tororo. A specialty of the region, tororo is a type of Japanese yam that is often served raw and grated with soba noodles, according to the waitress. After ordering my food, I chatted with the ojiisan smoking a cigarette to my right, first in Japanese, then in English since he was quite fluent. Apparently, he had worked in Vancouver, Canada for a good portion of his youth, so we reminisced about the Pacific Northwest, particularly the rustic beauty of its scenery and the open-mindedness of its people. After finishing up my meal, I said my goodbyes to the waitress and ex-Vancouverite, picked up a walking stick in a nearby souvenir shop, then proceeded up the mountain path. I had seriously considered also purchasing the shop’s yellow tengu boxer briefs but resisted the urge, mostly for fear of them being seen at an inopportune moment. 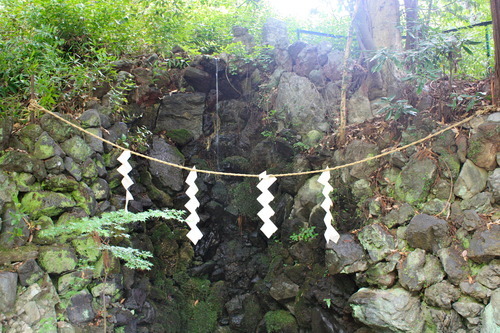 My first memorable sight along the trail was a tiny, trickling waterfall, which had been designated as holy by the Shinto rope that crossed its middle. 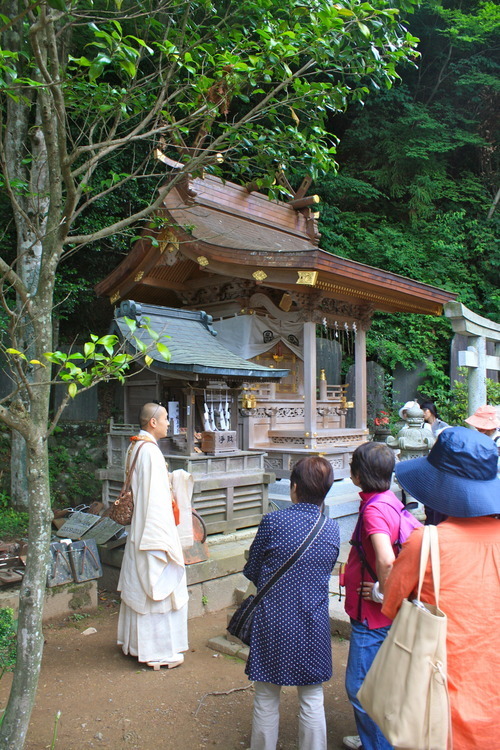 The waterfall proved to be a good preview for what was to come; as with many of Japan’s ancient sites, the sacred spaces throughout Mount Takao all seemed to encourage visitors to maintain a quiet reverence for the timeless perfection of nature. 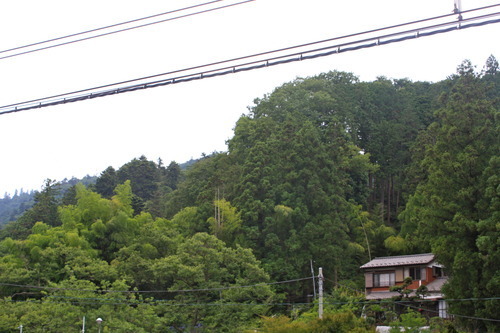 It was only by the moment I arrived at the halfway mark, where cable car and lift riders begin their hike, that the tranquility of the mountain path encountered any disturbance. Due to the nauseating humidity and the claustrophobic amount of people now making their ascent, I then decided it was time to cool down and rehydrate. After spending a few minutes drinking tea and patting away some perspiration with my handkerchief, I resumed my trek up the mountain. 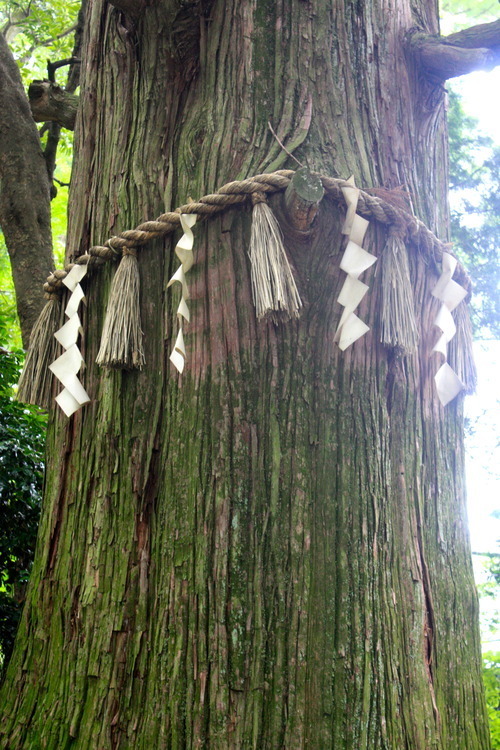 I didn’t have to walk far before crimson lanterns and wooden plaques signifying forgotten families began to line up on both sides of the trail, welcoming me to the entrance of Yakuo-in. 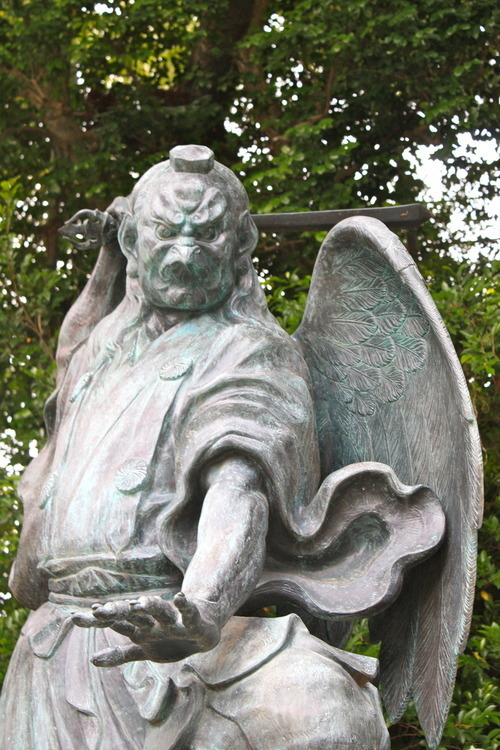 After climbing the last of the temple’s ancient steps, I lifted my gaze up to the enormous, winged tengu statues that stood in front of me, cast in iron and looking fierce enough to best any enemy, whether god, demon or man. 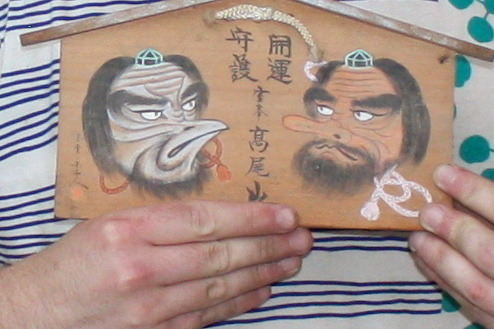 Besides the various depictions of the tengu, there were many intriguing sights at the temple to sate my curiosity. 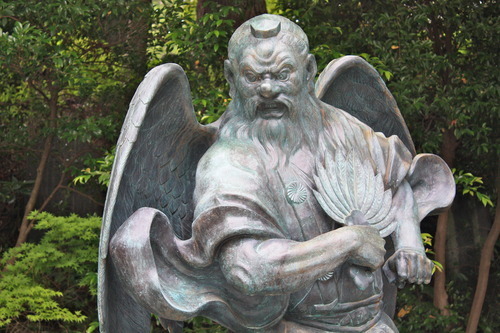 Although I couldn’t understand most of what was being said, I witnessed part of a tour during which a tengu priest, known as yamabushi, as he told the ancient origin story of Mount Takao with slow, sweeping gestures to a group of elderly Japanese sightseers. 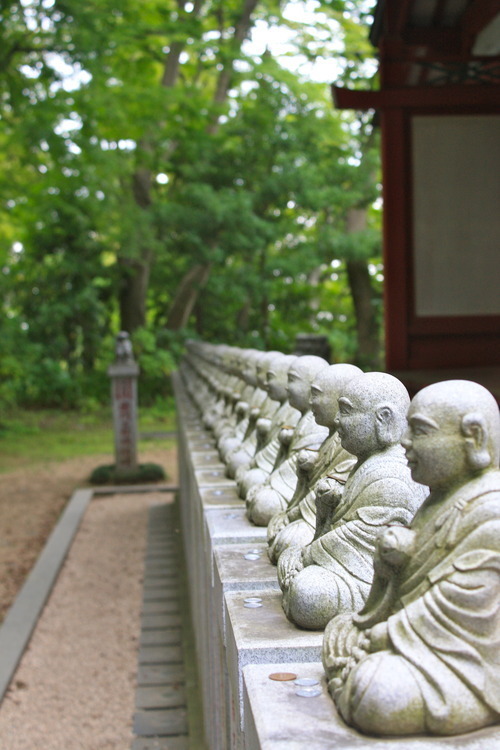 I also admired the temple’s orderly line of stone idols depicting former boddhisattvas seated in eternal zazen, as I am oft to do since taking up the practice of meditation. Eventually, once hunger began to set in again and a cone of vanilla ice cream suddenly appeared at the forefront of my mind, I left the temple and began to hurry up the final path that led to the summit of Mount Takao. 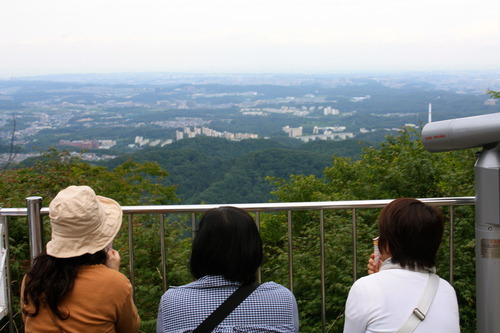 Apparently, I wasn’t the only one craving ice cream as I reached the top to find many exhausted hikers licking their soft serves, talking quietly and enjoying the spectacular view of Tokyo on the horizon. Taking a moment to relax, I bought an ice cream cone of my own, texted friends that I needed to respond to and then decided on my next course of action, which was to walk about eight miles over to the neighboring mountaintop before heading home. 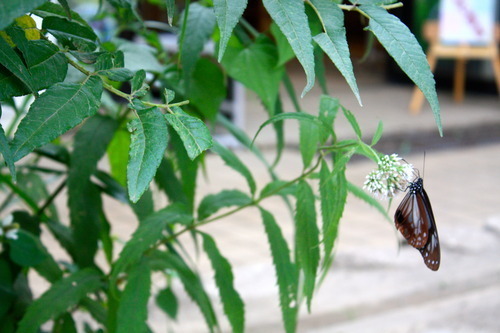 On the way, I took a quick peek in the Visitors’ Center but didn’t find anything particularly interesting besides a butterfly that had landed just outside the door. Then, about five minutes into walking toward the next peak, I noticed something very peculiar in the woods, lying just off an unmarked trail. 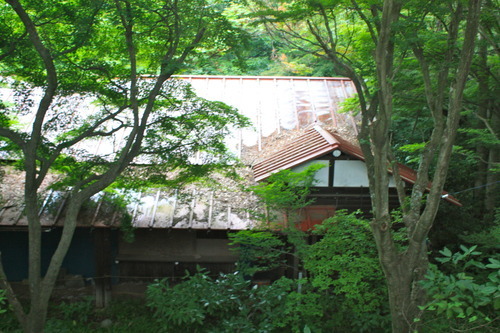 It was an old two-story house, suffering from the trials of age with a few of its windowpanes knocked out, moss growing over its rotting wooden beams and rubbish strewn all across its front porch. It might have been a very comely mountain home, back in its heyday, but clearly something must have happened for it to be left in such abandon. 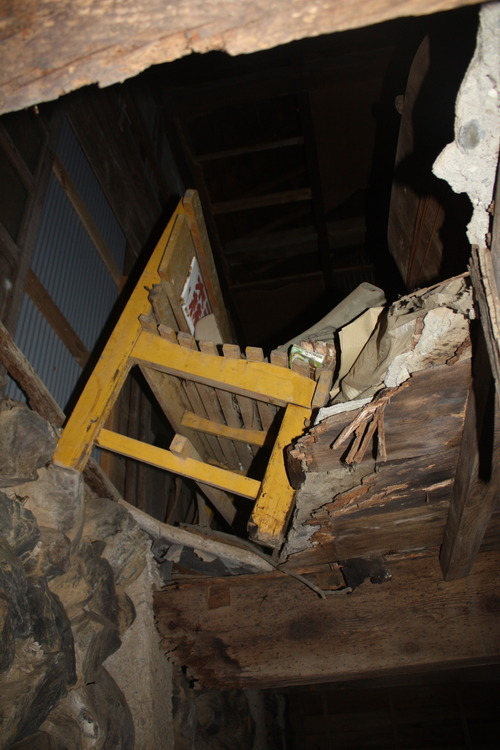 Perhaps I’ve watched The Goonies one too many times, but mysteries like this always bring out the daredevil in me because as I soon as I laid eyes on that house, I knew I would end up inside; it was simply a question of how I would do it. I walked around the perimeter of the house, weighing different options, and then looked for a place outside to leave my backpack and walking stick; the camera, of course, would be coming with me. I decided to enter through the second-floor sliding doors, which I could get to by climbing up a rock wall then crossing over to the rain gutter with my right foot first. Having left my things down by the rock wall, I managed to get onto the gutter with no trouble. Then, prying the squeaky doors apart with both hands, I emerged into a dark and hideous room, smelling of soggy paper and mold. Everything looked like it had been sifted through by a schizophrenic. 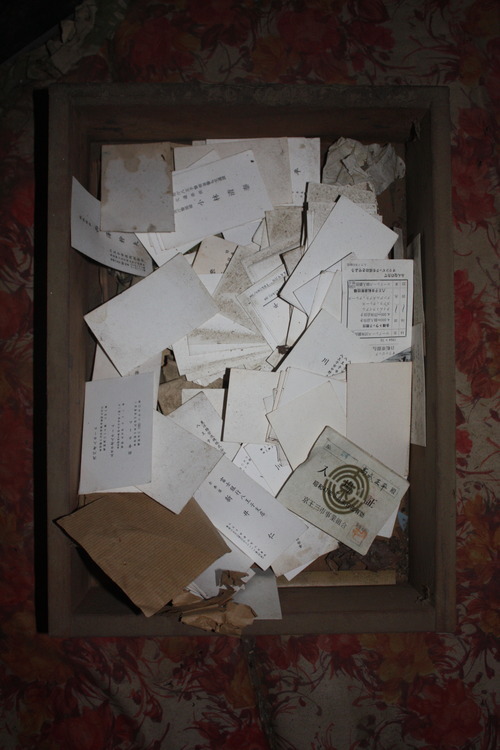 Dust-covered tea cups and plates hid beneath faded newspapers, cotton from a bed comforter lay scattered across the dining room floor and a box full of business cards was situated on the edge of a table. 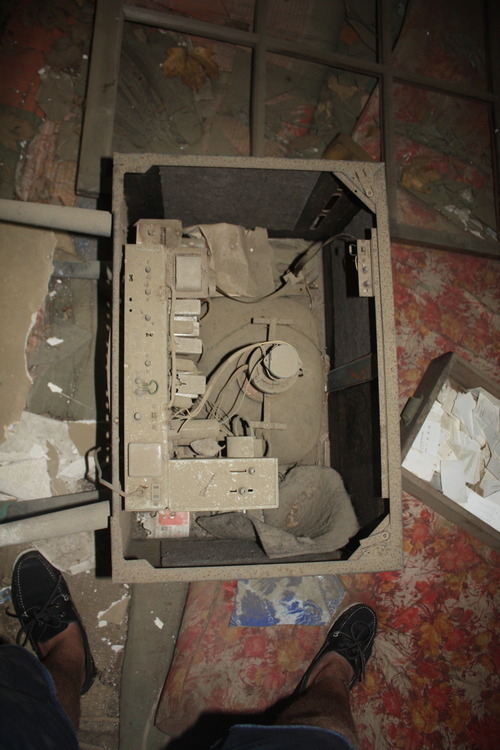 Just under an illegible Japanese script written on the wall, I discovered an antique television face down with its glass screen shattered and spread across the room. 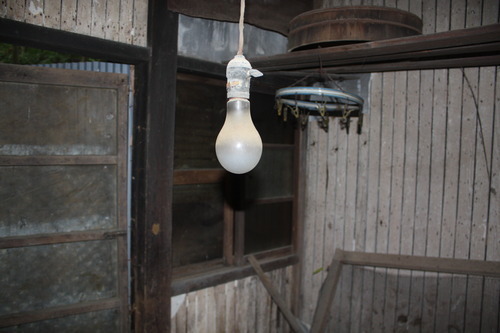 Then using the camera flash as a flashlight, I unveiled something even more disturbing: a gaping hole in the center of the room where a white bench dangled precariously, barely hanging onto the second floor. 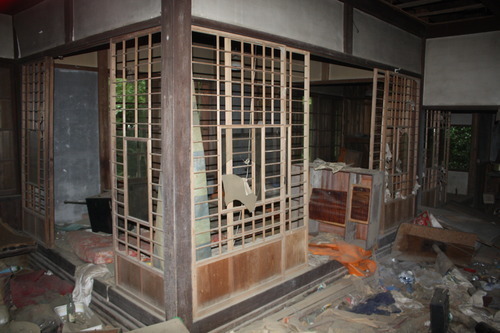 This made me think that perhaps the house’s abandonment had something to do with the Great East Japan Earthquake of 2011, but that didn’t quite add up when I discovered other messages written on the walls, as early as 2005. It really is difficult to imagine anything else that could cause that damage to such a scale. 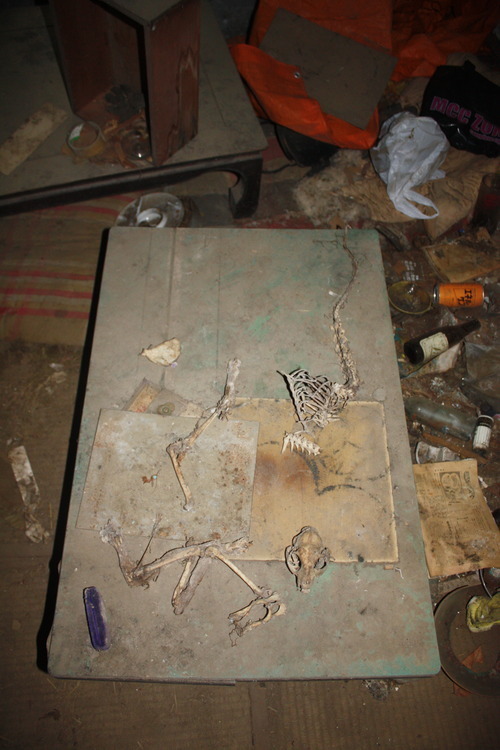 Whoever these people were, it seemed that they had probably run into financial trouble due to the tax forms I found laying around and the small animal bones left on their largest table. Having filched some tea cups, two intact black velvet tengu posters, a wooden plaque depicting Mount Takao, a flag for Takao National Park, a Kirin beer mug and a couple of cheap-looking manga, I gathered all my loot on the other table before heading downstairs to see what else I could find. Besides more tea cups and empty bowls of ramen, I didn’t find much. I mostly just found it interesting to imagine what the house must have looked like before it succumbed to years of neglect, especially the kitchen which was completely empty except for a few cast iron teapots remaining in the cabinets. 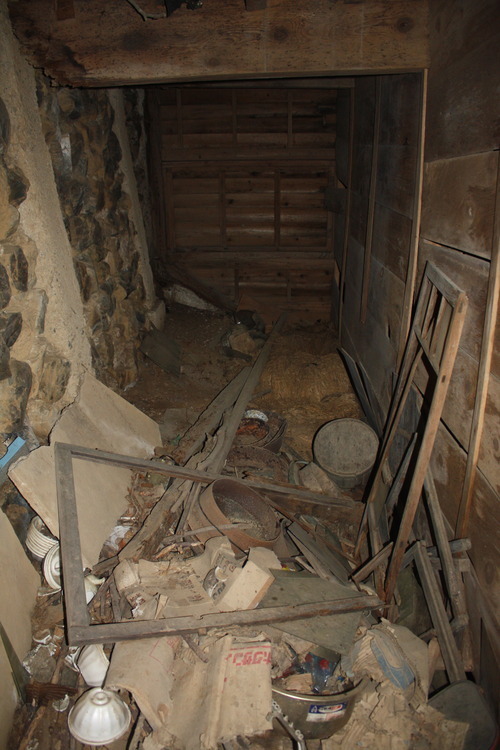 I then returned back upstairs to investigate an especially difficult room to reach: only by means of a single wooden beam crossing over the gaping hole in the floor could I discover what lay inside. Again, heeding the tantalizing call of adventure, I went for it. Although the beam often creaked, seeming to bemoan my weight on it, I slowly but surely made my way across. I didn’t find anything especially interesting except for a couple of pairs of gloves, that looked so strangely ordinary in the otherwise extraordinary house. 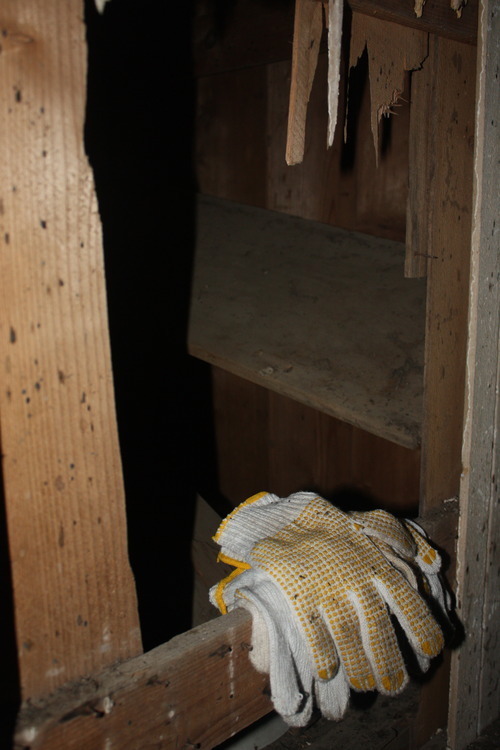 The work gloves seemed to be waiting for their owners to return and take them out gardening, as if a day had never passed. The door, leading outside, was still ajar as it might have been on pleasant summer days when the house was filled with people and light and warmth rather than an unbearable emptiness. With my sense of wonder thus extinguished, I wasted no more energy on the place, gathered my belongings, old and new, and left to find lighter experiences. 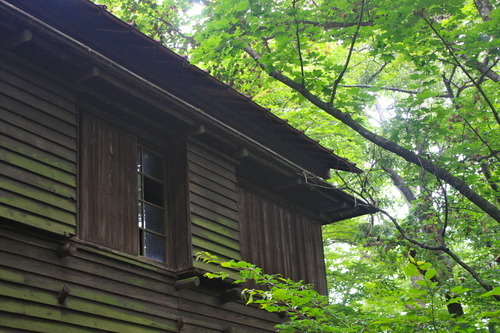 However, when I checked the time again, I realized that I had spent well over an hour in the abandoned house. 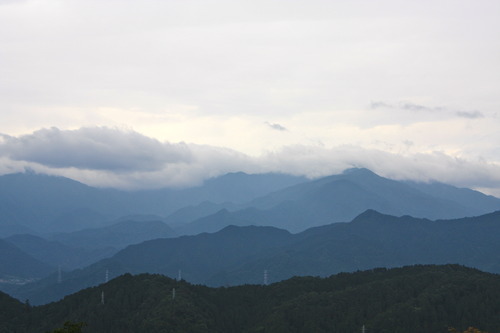 Since I had heard that Lake Sagami was worth seeing from a friend who had recently climbed Mount Takao, I hurried over the vista point before returning to the train station. Perhaps due to the inclement weather, I was unable to locate the lake but the view was majestic nonetheless, reminding me of the mountains depicted in the opening scene from Princess Mononoke. 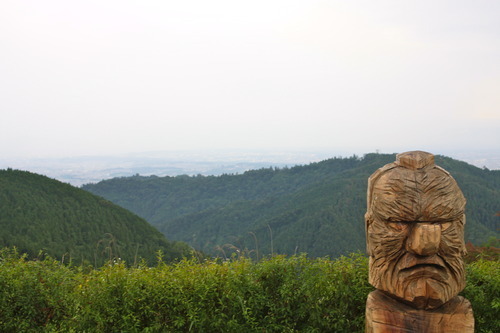 I also discovered many sculptures chiseled out of wood along the way back down from the lake, one of which was, of course, a depiction of the tengu. As I walked further down the mountain, reflecting on the luck of my day, I decided that I may as well pay the big-nosed devils some respect before heading home. 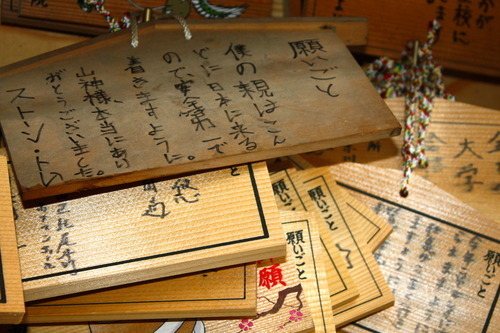 So, with my new wooden plaque in tow, I stopped by the temple to drop them a message. 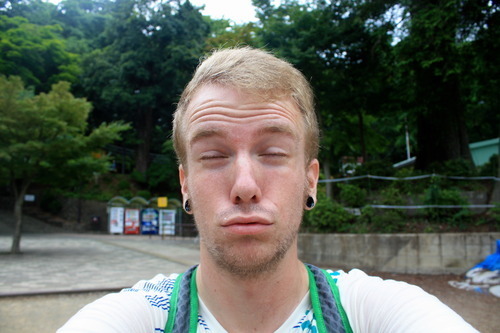 This entry was posted in 2012-13, Tommy Stone '14, Japan and tagged abandonedhouse, buddhism, hiking, japan, outdoors, shinto, takaosan. Bookmark the permalink.